Radike Samo is an imposing presence at the back of the Reds' scrum and his first-choice position is at No.8. He is known for holding the ball in one hand and using the other to great effect bulldozing his way through opposition defences. 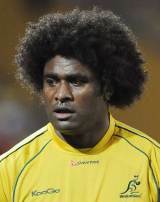 He played for the Fiji U-19s before winning six caps for the Wallabies in 2004. In the summer of 2006 Samo journeyed to the northern hemisphere from the Brumbies - where he had previously played 41 times - to join Stade Francais. After two seasons - and scoring a try on his debut against Clermont - he returned to the Queensland Reds as short-term cover for the injured James Horwill. After a quite brilliant 2011 season - where he was instrumental in the Reds' victorious campaign - Samo forced his way back into Wallabies reckoning - seven years after his previous cap. He was named in Australia's 30-man squad for the World Cup and played an important role for the Wallabies, even featuring on the wing.